Thank you Judy for making our day AWESOME! My husband and I could not speak more highly of Judy who married us back in April 2015. Judy made the process for us as easy as possible, including supplying a range of different vow options, suggesting wedding vendors and always responding quickly. Thank you Judy for your fantastic work. Lyndal and Dave April 2015. 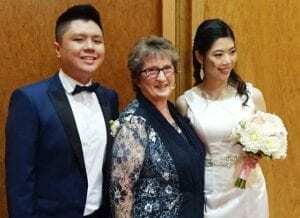 Judy was the perfect celebrant for us. She accommodated all our special requests and kept us on track to ensure our ceremony was personalised and ran smoothly on the day. Thank you very much. It was a lovely ceremony – I think it actually fitted us very well. Thank you so much for what you did for our marriage ceremony. We had an excellent experience last evening. For our life together a fabulous start. We wanted to say a BIG thank you. The day was just perfect and thank you once again for marrying us. I recently attended a wedding ceremony conducted by you for a friend of mine and I was so impressed with your kind smiles and your professional yet simple style of conducting the ceremony. I would like to invite you to be our Wedding Celebrant. Many thanks for your help and support in the weeks leading up to the wedding as well as on the day. We really feel like your personalised touches helped make the day as special and personal as it felt to both of us. 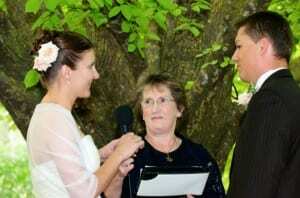 We would happily recommend you to anyone needing a celebrant. Judy you were extremely helpful and your service was top notch. Couldn’t have done it without you. Thanks for everything. Thank you for being a part of our wedding day. It was exactly what we were looking for if not more. I would just like to thank you again for all your wonderful help leading up to and on our wedding day! Your suggestions and guidance was very much appreciated as was your willingness to let us really personalise our ceremony! The whole day was absolutely perfect and everything I had hoped and dreamed it would be. Thank you for conducting our ceremony It couldn’t have been nicer. 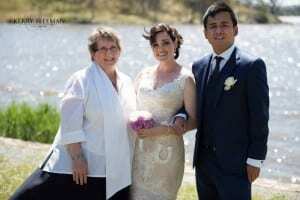 Many thanks Judy for the wonderful ceremony we had in reaffirming our marriage vows. 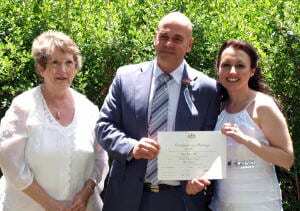 We wouldn’t have had anyone else conducting the ceremony…we think you are the best celebrant in Canberra! 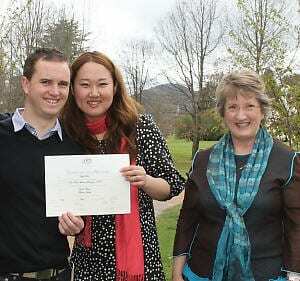 Thanks Judy, the ceremony was lovely, you did a great job (with our Renewal of Vows ceremony). The certificate looks so beautiful. I will certainly recommend you to others.